As it get colder, its already hard enough to get out of bed… I have a solution. 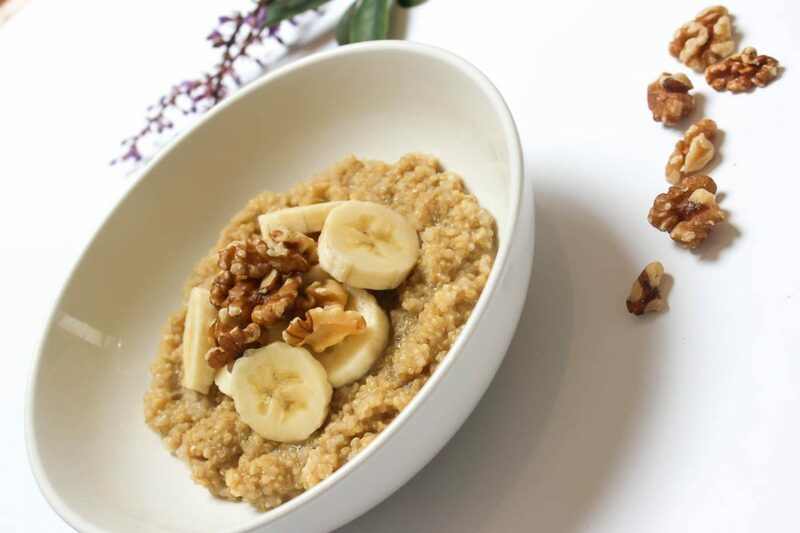 This quinoa porridge is so warming and filling!! I literally go to bed and can’t wait for breakfast. It takes 15mins to make so you can still rush out the door. The best part is it’s a low-carb and gluten-free option to oats. Quinoa has been around for centuries and known as one of the big players in the Superfood world, but did you know it’s the most protein rich food! It contains all NINE essential amino acids. It is also a great source of Iron, which allot of women aren’t aware they are low in. Receive updates, special offers, nourishing recipes and tips to live a wholesome fulfilling life! Place Quinoa in a saucepan with 1 cup almond milk, cinnamon and nutmeg and bring to the boil. Add half of the banana diced and add to porridge with remaining milk. Cook for 15 minutes, stirring occasionally. Add water if porridge looks dry. Stir through Nut Butter and serve with toppings.